So, do we remember my post about Certified Humane products? If not, you may want to go back and read I’m No Hippie, But… That will give you a little background on why I’m taking the time to review a cup of yogurt. 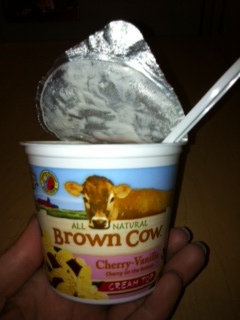 Today is the end of my work week, and I’ve been eating my Brown Cow yogurt and I’m ready to write a review. I have to admit, I hate artificial sweeteners of any kind. Yes, Splenda may be made from sugar, but I’m sorry, no matter what you say, it certainly does not taste like sugar. Seeing that honey, cane juice and pure maple syrup were the only sweeteners used in this product, I was immediately impressed. Moving on to the yogurt itself…when I first peeled back the lid, I was surprised that the yogurt looked pretty gross, like everything had separated. Then I remembered the label said “cream top”, this must be the cream. I was right. It took very little effort on my part to get the yogurt mixed up, and it looked and tasted creamy and delicious. No gross after-taste, just pure delicious fruity yogurt goodness. All in all, I can say that the only yogurt that rivals Brown Cow for flavor and quality ingredients is Tillamook. However, being Humane Certified, this Brown Cowyogurt makes my heart feel as happy as my taste buds. An added bonus? The label tells me that the company dedicated 10% of their profits to the earth. You’re welcome, Planet Earth.